Having been in back recovery mode the month began in Saigon as it did before . I didn’t do any travel beyond the city limits, which gave me time to catch up on work. I changed the theme of the site so it looks a bit different if you haven’t clicked though from mobile. L'Usine cafe as seem from Dong Khoi St, Saigon. My three month visa in Vietnam was up so it was time for a visa run. This was the first time I’ve travelled since my back injury so I was wary of how I would go. I’ve been walking around no problem but spending half a day on the move was a new test. Fortunately the travel day went ok.
Bangkok was an easy choice for me for visa run city. As I said last time I was here, I could see myself living here for a while. I didn’t book a return ticket but I’ll end up spending three weeks here. I’m staying in the Silom/Sathorn area, which is not somewhere I usually stay. I found a great place on Airbnb in an 1960’s house that feels like it’s in the countryside. After my Airbnb time ran out I moved around the corner to what used to be the old backpacker area of Bangkok. I had heard of this place but never knew where it was. There are all these run-down guesthouses and abandoned travel agencies who were probably doing a good business in the 90’s. It’s still a good area to stay though, so I will be posting a report on the area. I’m a ten minute walk from Lumphini Park, which every time I go I think that I should go more often. It’s one of my favourite urban parks in the world so I am making it a daily habit to walk there. Not far from where I’m staying is the new tallest building in Thailand. 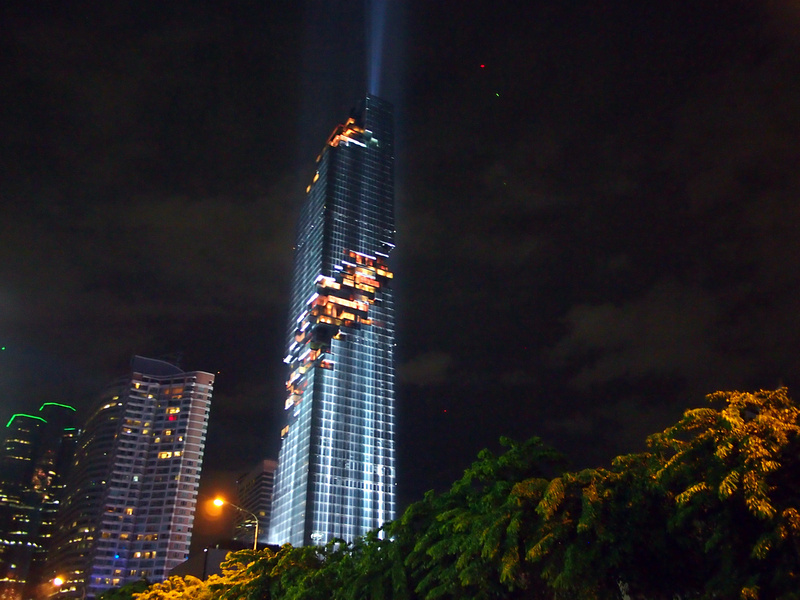 At 314 metres the Mahanakhon is not the tallest building in Southeast Asia, but it’s one of the most distinctive. It looks like a regular glass tower except that there is a swirl of pixelated windows that wrap around the building. The further you are away from the building the more it looks like missing pixels. The Mahanakhon had its inauguration night so I got to see the impressive light show. 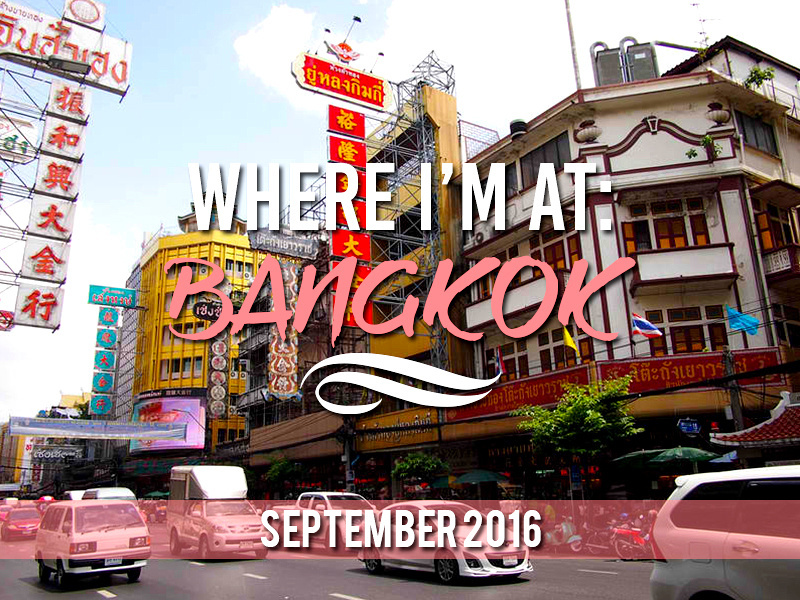 I have another week in Bangkok, mainly meeting up with friends and working on some Bangkok-related articles. I’m working on another railway article which is related to Bangkok as well. The first railway article is below. After Bangkok it’s back to Saigon for the rest of the month. No new travel plans apart from some domestic Vietnam travel. A complete guide to train travel in Southeast Asia – I’ve compiled a list of every country in Southeast Asia where you can catch a train. 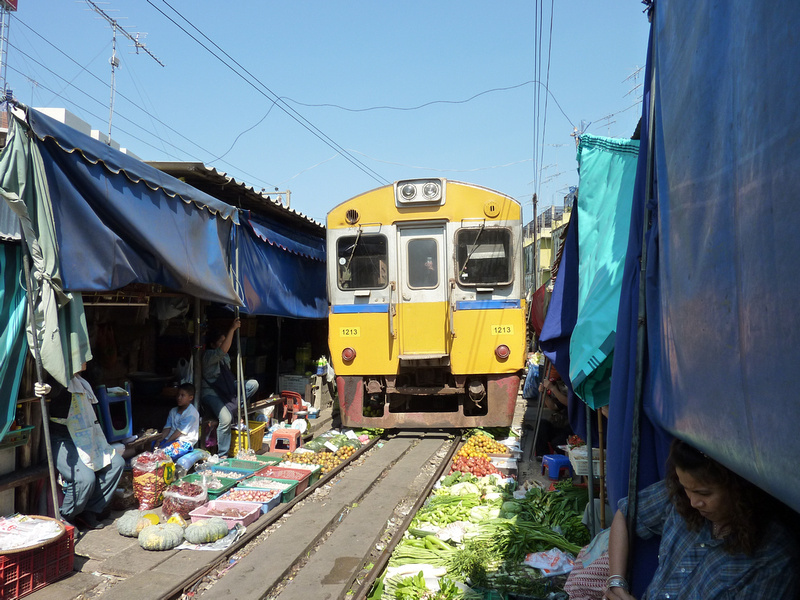 I included some of the memorable and unusual trips I’ve taken, such as the Maeklong market train in Thailand, where the train goes through the market. Travel Blogger News: September 2016 – A round up of articles about the travel blogging world. How to visit 30 countries in 3 months with a Eurail Pass – I’ve always wondered how you could do this trip so I worked it out. ONe day I will do the 3-month Eurail trip. Thank your a great article. I’ve been to Bangkok number of times, always staying somewhere near the Ko wasan area. Where is the old backpackers area you’ve mentioned? Hi Eve, yes it’s Soi Ngamduplee. I will write more about it later! Feel well and keep on. Can’t wait to get to BKK and catch up on everything that’s new … that building looks incredible!